Lots of new Blurry Belle pieces: Hi Rise Wunder Under Crops, Real Quick Tights, Essentials bag, Energy Bra, Power Y, and Boogie Shorts. 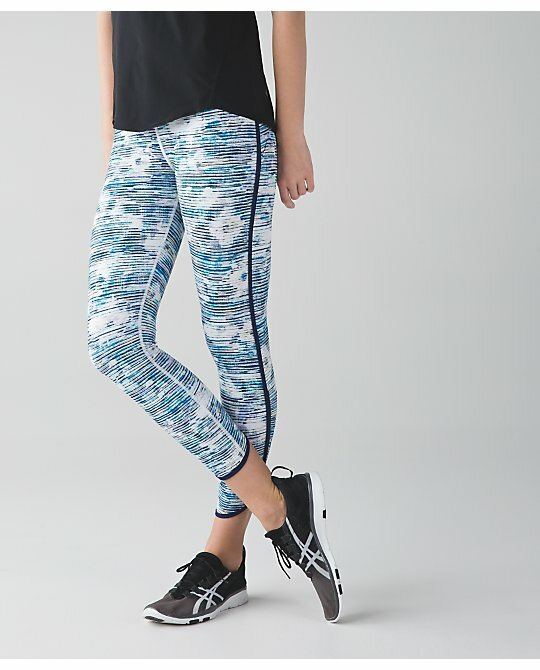 I am tempted by the Wunder Unders. I am very tempted by the Inkwell Ready and Go tank. This sold out in Canada pretty quickly. Lilac Time to Shine Skirt, Ta Ta Tamer, Enhearten Tank, Salute the Sun Singlet II, and Swiftly SS. Canada got Pretty Prism Pace Rival Crops. I ended up returning the Pretty Prism Speed Crops I ordered a couple of weeks ago. They were pretty but didn't look good on me. Making Moves Bra, Jacket, Tank, Tights, and Shorts. The Black Swiftly Tank is on the US side. This actually happened last Thursday. Deep Zinfandel Cool Racerback. I ordered this. Just the Deep Zinfandel CRB for me. Did you get anything today? 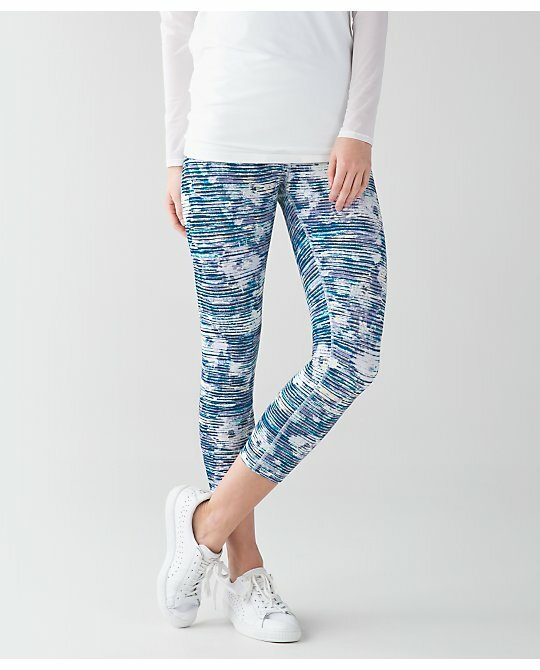 I tried the real quick tight in store in two new colors (blue and stripy floral with lullaby) and the luxtreme is so thin, I couldn't justify it even thought they fit great. So disappointing, the miss mosaic print and black are very good quality luxtreme, I was excited for these so much. I also tried the making moves tight and liked the fit but I think the luxtreme is too shiny. Left without making a purchase because I know the fabric so well, and it just wasn't worth it. What a waste of good design. 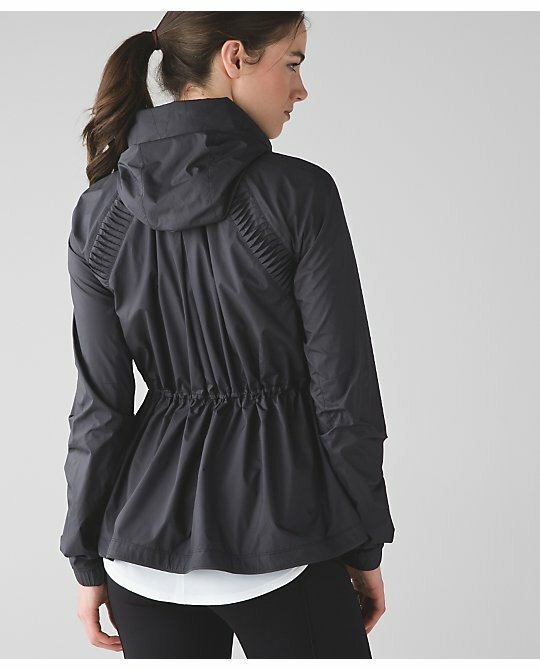 Love the Gather and Sprint jacket in black! Every time I say I'm done for a while they bring out something I have to have. Gotta save for SeaWheeze! Nothing from the upload for me. I am debating buying my first long sleeve swiftly in one of the pinks (maybe boom juice) but again the reviews are terrible. Not sure if I should give it a shot or not. Bought the blurry belle ftbw bra in store today, nothing else for me online. 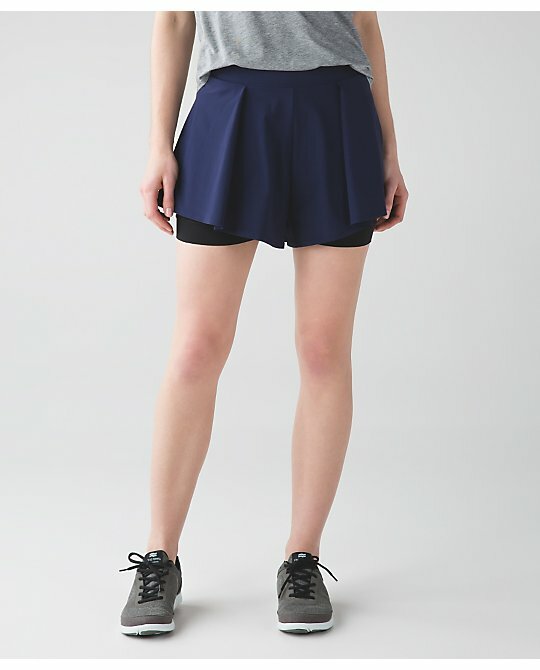 The cruiser shorts are my FAIL of the week.. Just hideous and unflattering even for a size 2. Why not come out with more solid colors for the spring break away shorts... 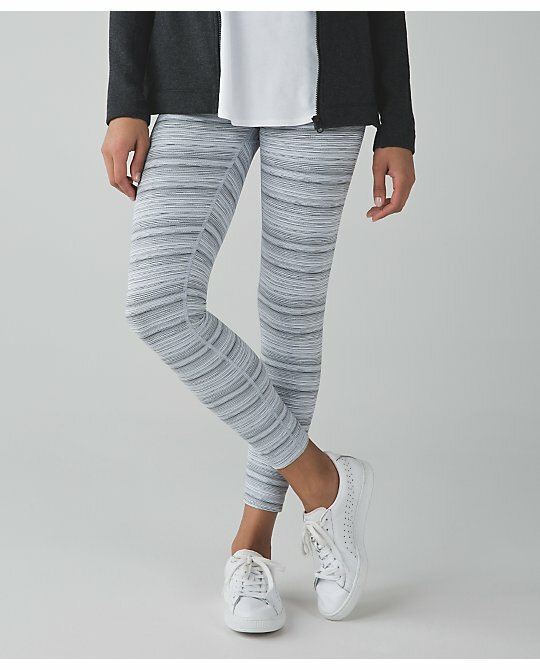 They always sell and are great basic pieces. All these new weird pieces every week.. Just give me good quality best sellers in more colors!! Anon 5:40 I ordered the Gather and Sprint jacket in black, I can't wait for it to arrive... come on Thursday. I love swiftlies! I wear at least one (ls, ss, tank) every day . 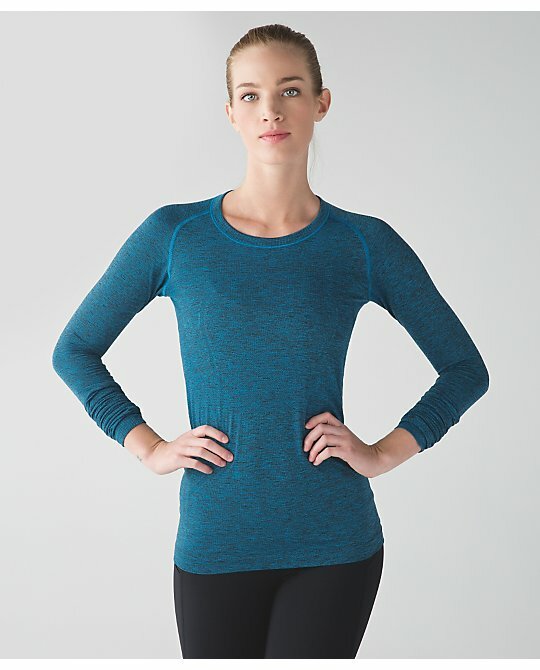 I wear the long sleeve to run, cycle, to and from yoga, base layer in the winter, the list goes on. The time I find a get snags is if I coming to contact with Velcro. If I do get a snag I pull it through the other side and you'd never know it was there. I was torn between the WUCs and the Real Quick Tights in Blurry Belle since I love the print so much, and ultimately went with the Real Quicks. I hope they're not as thin as the other commenter noted! I just love the navy trim with that print. I was in store briefly today and tried on both bottoms in BB print. First print in a while that has tempted me on tights. While both were nice there was something about the Luxtreme version that I didn't like as much so I purchased the WUC instead. So glad I got to try them on because I am normally a Luxtreme girl so I would have ordered those. 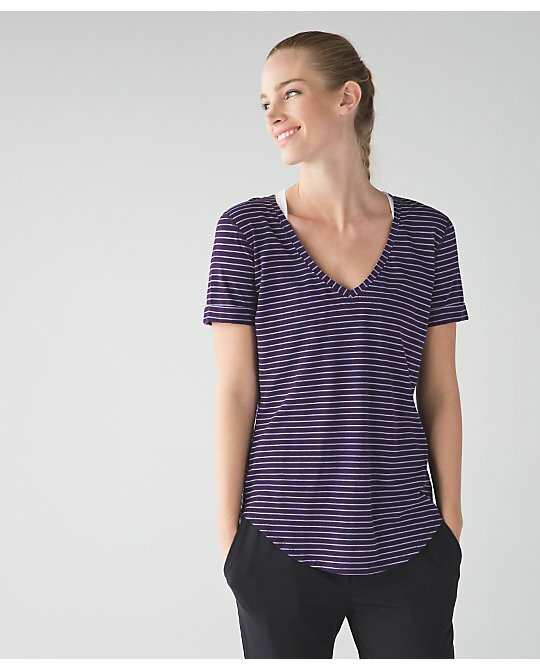 BB is really cute in the WUC and goes great with lilac. I love love love that inkwell tank combo but unfortunately it's way overkill support wise for me but it's so pretty! 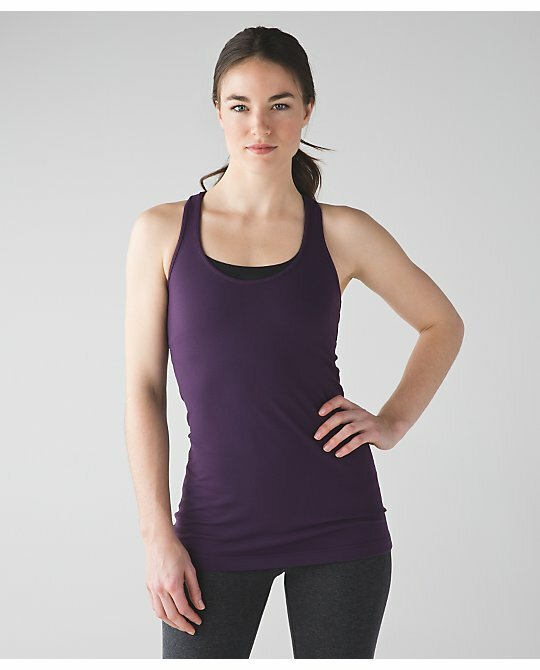 Also ordered var city tank in hero and lilac but not sure I will keep both. $70 for the MM tank. No way. the Gather and Sprint ghost dot Navy has me REALLY tempted, but I'm having a hard time paying $138 for a lightweight jacket when day time temps are already in the mid-70's here. It is REALLY cute though. I'm feeling like that making moves LS is for sure going to be mine, I have the silver fox high times in my cart at the moment as well- did anyone else see the blurry belle battleship hightimes appear and then disappear from the site? What happened there? Anon 5:47, I own about 5 or 6 swiftlys and have never had a problem...well, except that the cuffs seem to get very dirty easily! I read all the bad reviews and wonder if I've just been lucky. 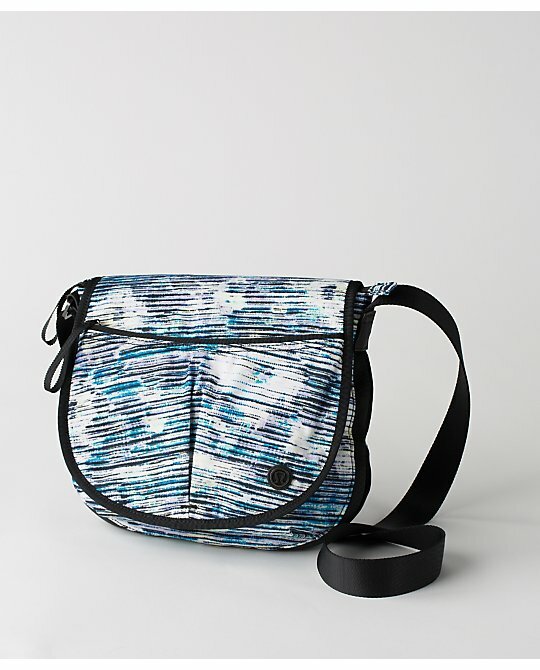 Maybe get one on WMTM or final sale at the store and try it out first? I love them! Just the Deep Zin CRB for me. Despite the appearance (imho) of the pale yellow "stain" on the beautiful blurry belle, I may have to cave. Would like luxtreme High Times. Maybe the Real Quick Tights. Will wait for reviews. Has anyone looked at that print closely? Reminds me of the inky floral red/navy on white speed shorts...a pale yellow odd color in the print. Must have Pretty Prism Pace Rival Crops in the U.S.! Anyone know whether the cyber stripe high times actually like up? I can't believe how quickly the Deep Zinfandel CRB sold out online in Canada! I'm so disappointed I missed it - I added it to my shopping cart and then when my order was processing it said it wasn't available :( I really hope they'll restock them for those of us who missed out. I like the Deep Zinfandel Precision Jacket. Also, fingers crossed we'll get the new Lilac TaTa Tamer in Canada soon - it's really pretty and I need some solid lighter colour ones to wear with the more sheer lighter colour CRBs that I have. @ anon 6:22 pm - I didn't even realize it was that much! No way for $68. @kendahl I really hope you like them, I hate being right about these things. 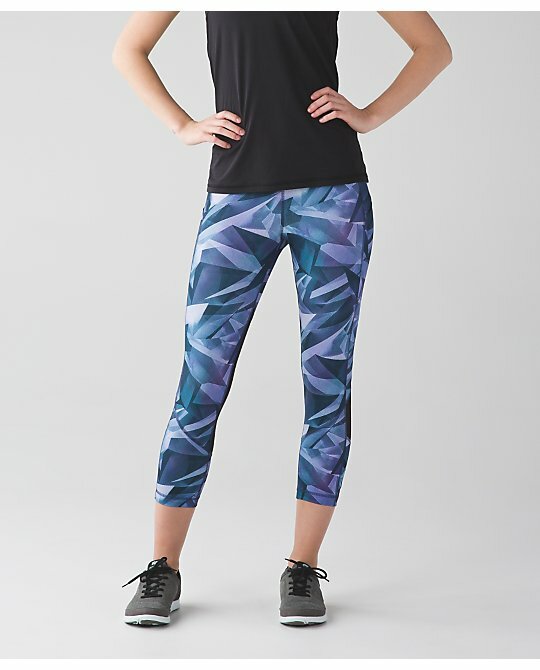 I have no complaints when it comes to fit- the real quick tight is gorgeous, but the luxtreme on these is nothing like miss mosaic- it's noticeably thinner-Please let me know what you think! Still waiting on a jungle green or hero blue crb to go with the WU cyber jungle green/hero blue crops I bought the other week. Don't want to return them, but can't find anything to match them either! I like the look of the heathered kayak swiftly, but the picture online looks nearly identical to the heathered peacock blue from a while ago. Can anyone who has seen this in person weigh in? Is it a nice (different) color? Also, I ordered the essentials bag last week and it happened to arrive right before I left for a trip. So I put my wallet and purse in it and have been using it for a few days straight now. I love it! Very comfortable to wear and functional. Just thought I'd put that out there in case any readers were on the fence. So sad they're only offering the Love tee up to a size 10 in Canada...what the heck??? Omg Anon @659, that yellow "stain" totally ruined the inky floral speed for me! Someone commented that they looked like pee stains and I couldn't stop picturing it. Thank you for the responses on the Swiftly's, this is good to know. Might need to give them a try! I ordered the Blurry Belle Wunder Unders to try. Not sure if I'll keep them but they kept calling to me. I took the tags off my Blurry Belle CRB today. I just love this print. I also LOVE swiftly!! I own 20 or more in SS and LS and tank. I wear them to work everyday. I am a physical therapi, so I am pretty active on them. I also wear them for all my running in the winter. I have only snagged two in 5 years. They are more delicate, but if you care for them they will last a long time!!! @ Anon 5:55 PM I can't wait to see it in person. I've been wanting a new spring jacket for a while now. I feel like my Spring Forward jacket has gone out of style. I was thinking the same thing about the peacock and kayak! I took screen shots of the kayak and peacock t-shirts out of curiosity and they look quite identical to me. I'm sure there's a difference, but since I have the peacock, I'm not sure I that I can justify! Deep zin crb in stock again on Canada site! Nothing for me this week which is fine since last week I bought the black s/s Swiftly, DZ Street To Studios and lilac s/s Swiftly. The week before I bought the DZ Real Quick Crops and really like them a lot. 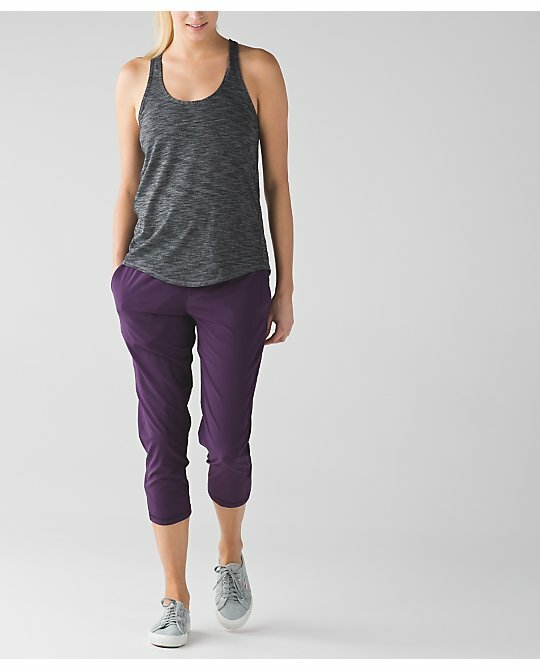 I would like to see more 17" inseam crops come out this summer. I tried on the Making Moves Jacket but didn't buy it. The neck/hood although nice when arranged certain ways was just too much fabric around the neck for a spring jacket. 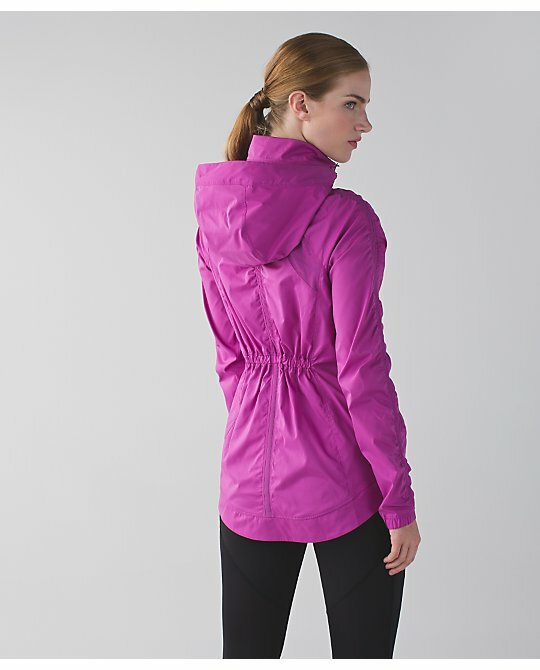 The pockets are placed too far in front instead of on the side and it is a very short jacket. I don't mind a cinched waist but on this one it has to be fully cinched to look right but lift your arms slightly and the jacket lifts up and has to be pulled down. 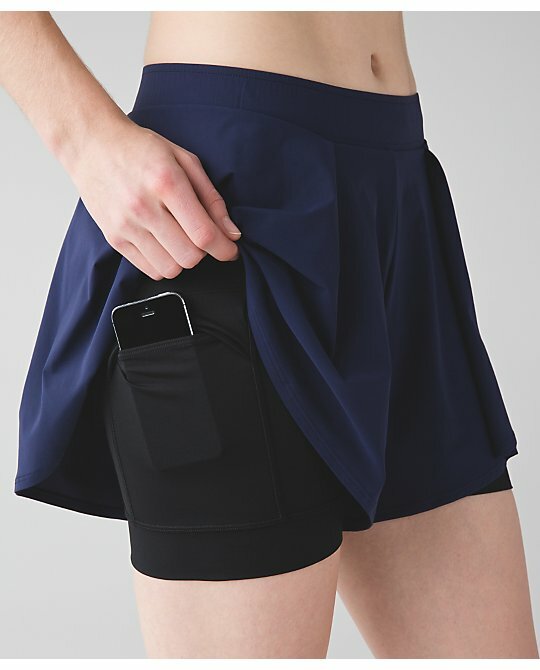 For a running jacket I don't like this feature. For $128. 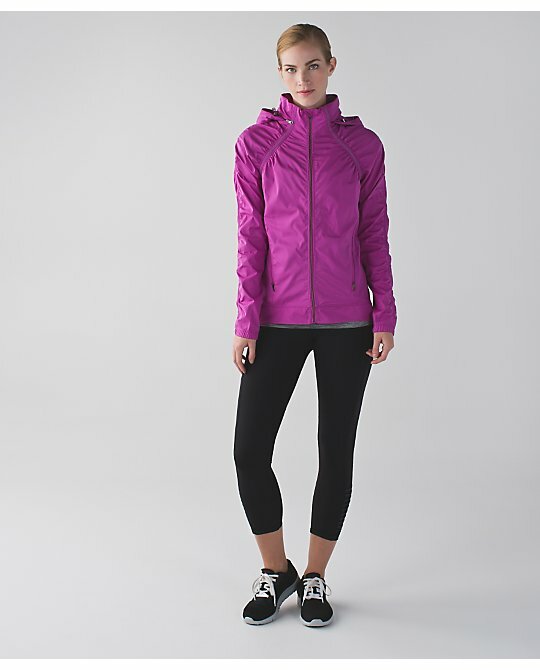 it is a pretty jacket for casual wear. I saw the Making Moves Tank and the pleats and reflective detail on the sides is very stiff, I didn't bother trying it on. Those Cruise Shorts are hideous. 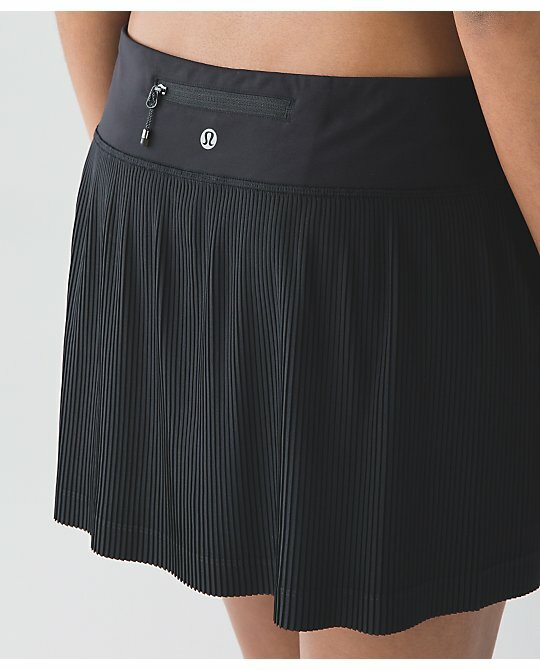 I love the idea of the pocket on the fitted shorts, but the top should be a skirt (not shorts). As it is, that design just looks silly. Nothing for me this week. I am going to swing by the store to see if anything catches my eye. I am interested in a few things, but just may end up with another pair of Spring Break Away Shorts instead. I used to be the biggest fan of CRBs and didn't wear anything else to workout. 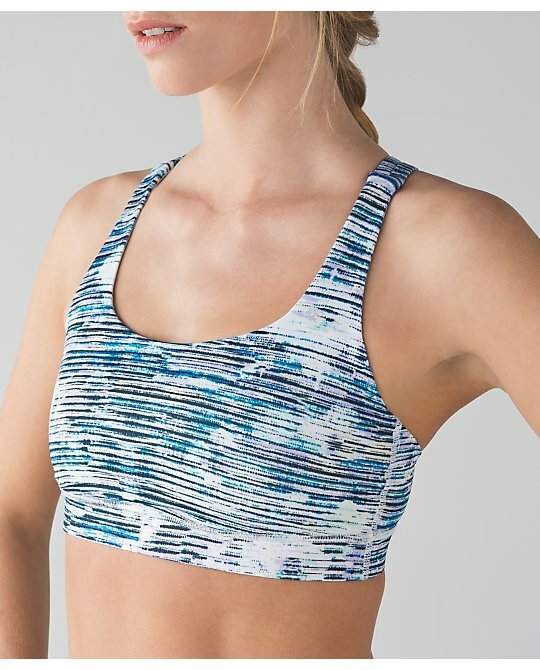 Since Lulu has been on an ugly color/pattern spree for the past year I have really bought any and instead I have discovered the Yogi Racerbacks from Lulu and the Alo extreme racers. I love that both of these tops are a bit looser and forgiving but still flattering. A year ago I would have jumped all over the Deep Zin CRB, but I just can't get interested in it right now. I love my swiftlies too. All snags have been my fault (wedding ring) and happened because of my stupidity. Barring my wedding ring snagging it I have had snagged them any other way. I have a tumble washer (so very gentle on clothes) so I haven't even used a lingerie bag to wash them either. I like the deep zin crb but didn't buy it just because I feel it's too dark for spring/summer wear and by the Fall I'll be over it anyway. Give me a week and i'll be over it and won't want it. I did buy the Rio Speeds and Blurry Belle speeds - probably the first new item from a store I've bought since Seawheeze back in August.